And it's a good reason. 2GHz @ 0.975V. My T4200 consumes 28% less power at 2GHz compared to un-undervolted (to coin a term), and 43.75% less power than a T3200 from Acer. That translates into slightly longer battery life (most of the battery drain comes from the LCD backlight and the northbridge) and more importantly, cooler and quieter operation as the fan does not have to spin up that often. But this chip can definitely do better. A lot more better. That's the problem of having voltage control limits. Something like multiplier lock, but for voltage adjustments. Without it, it's easy to reduce power draw by at least 33% at near stock speeds. Just as it is easy to overclock at least 33% at stock voltages, or 50% for the cooler and slower Intel entry-level chips. 28% is so little - my A64 at home is running at 38% reduced power, although with a 14% reduction in top speed. 0.975V is the lowest that Intel allows, and it was too easy to hit. Considering this is a 45nm chip at 2.0GHz, based on a technology that can easily do over 3GHz on 65nm with minimal or no voltage raise, I expect this chip to be stable at 0.9V or less. Still, it's better than nothing. Oh, and the reason I only did it now (usually I underclock CPUs the day I get them) is because the Multiplier Management of CrystalCPUID (the function responsible for this) does not work in Windows 7 - one more score for XP. You may say - it's unfair to the T3200 as I didn't compare it undervolted. 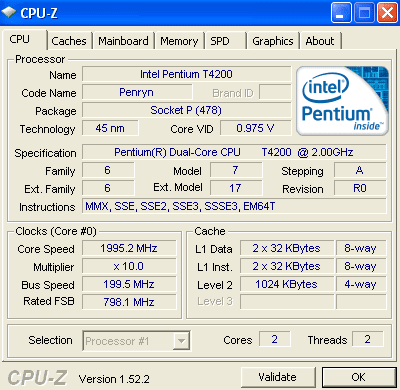 But the lowest a T3200 can go is 1.087V - this is the limit imposed by Intel. Or even higher, if that T3200 can runs @ 1.3V. What's the deal here? Well, Intel has a very strange system for the new mobile processors out there, the same VID translates into different voltages for either different CPUs or different mainboards, I can't remember. But I'm sure I've read it somewhere. And it's the problem that affects the 45nm "Penyrn"-based processors, like this one. In fact CrystalCPUID says the lowest voltage setting is 1.087V, but I get 0.975V with it. Something strange, nothing spectacular, nothing to be proud of, nothing to be flamed about. Just something normal, and get on with life. How did you undervolt it? I'm using a Dell Studio 15 with a T4200 and RMClock doesn't allow undervolting below 1.1V VID. Goodbye Windows 7, Welcome Back Windows XP.